Two new Remaining Value over Remaining Life depreciation methods provide the ability to use either the Mid-month, Half-month and Mid-quarter averaging conventions, when changing the remaining life of existing assets. 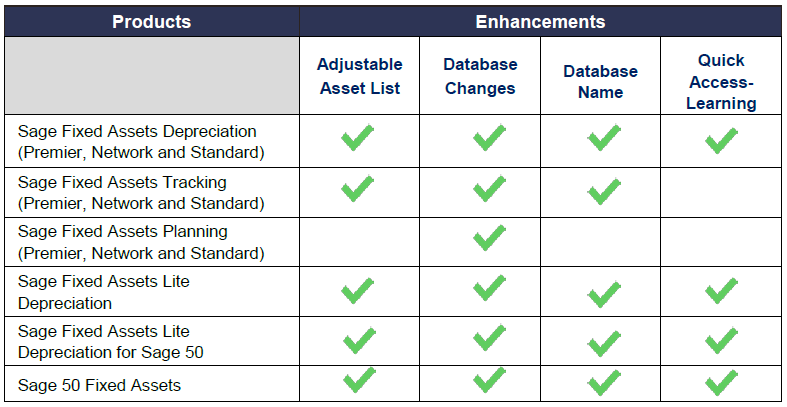 In several areas of Sage Fixed Assets, existing product functionality has been enhanced. An update to the user interface features a modern, professional visual experience that’s aligned to the style of other Sage applications. In addition depending on which product you use, a new Asset List Control feature allows each individual user to set the Asset List’s row height and font size to your personal viewing preference. Download the Sage Fixed Assets 2019.1 release notes for full details.